I have been living in Africa since 2002. I traveled and worked in more than 20 countries in the continent. I worked in conflict areas such as Dem. Rep of Congo, Sudan, Somalia, Burundi. But also in post-conflict countries like Rwanda, where I lived almost for 5 years. My job as a photographer takes me to places where nobody goes. The beauty of the place is often paired with the destruction and death caused by conflicts, diseases and natural disasters. I was looking at some portraits I took in Somalia some time ago, and I realized how everyone was looking at me proud, trying to tell me something. I understood that looking into the eyes of every person I photograph is the most heavy burden I carry with me everyday. Most of the people I photograph are victims of war and diseases, the poorest among the poor, sometimes even the strongest beyond what's imaginable but always struggling to survive one way or another. 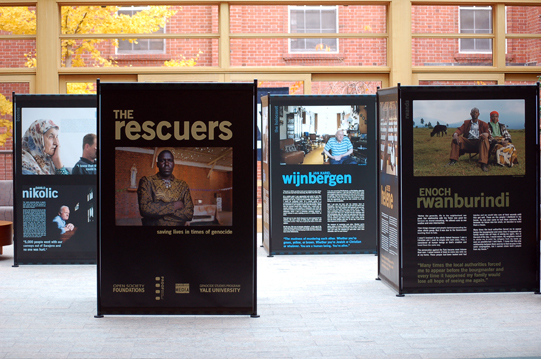 Riccardo Gangale's photograhs of Rwandan rescuers are featured in PROOF's "Picturing Moral Courage: The Rescuers" exhibition. I am there with my privileges, I can leave when I want, I don’t belong there, I am a stranger to them. Sometimes they think I can help; maybe they think I am from some aid agency. I can’t do anything for them, just get the picture. Still I have to get to the soul of everyone, I have to gaze upon darkness, I have to imagine the pain inside everyone. For me staring at the eyes and connecting to their souls is the most inner trip to human failure as their eyes show no hope. And I can only sell, in the end, my own failure. My pictures will be on some newspaper page or on a campaign flyer to save starving kids. After few days, nobody will even remember the name of the people in the photograph; after a while, not even the picture. The market of news and the media in general obey the same rules of the economics. A gruesome photo sells more; most people read gossip not The International Herald Tribune. Therefore, it is difficult to propose stories that tend to show positive aspects and depict Africa or other topics outside the standard ones. I know photographers who are ‘smelling’ blood, looking for a picture to win the World Press Photo or the Pulitzer. But running after your own fame is not what a photographer should do. While looking for the sensational picture you may walk on blood; you show no respect for the people are suffering around you--they are just a mean for you, not human beings anymore. You don’t think, even for a second, that it could be you in that shelter, with no food and water, running away from war, having lost everything you had. After all these years the main feeling I have is frustration to know things will never improve. The failure of United Nations, European Union and NGOs to solve problems--they just sustain themselves with their rich salaries and sometimes absurd privileges. I feel sadness for governments that steal everything in Mobutu Sese Seko style, creating greedy people and kleptocracy, and rage for rebel groups with names that usually include the word "freedom" or "democratic" but are usually just a brutal bunch of drunken bandits with AK47s. Missionaries and religion sickness are throwing away free-thinking chances, education, and eventually the foundation of democratic states. But, above all, I can see how the richness of the continent is still stolen by Western countries; usually multinational companies' interests are more important than human rights. I keep working as a photographer just to witness and create photos that a few people still want to see, for those who still have an interest in getting a glimpse on how the world is turning in all corners. In my opinion Africa, like most of the world, is not a place for saviors, just a place for uprising.